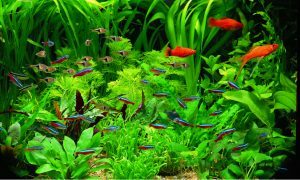 Although natural water plants make a nice addition to an aquarium, they are not mandatory for your fish to feel safe and live a long and fulfilling existence. In fact, water plants are quite tricky to grow and require special treatment, just like any other living organism. Not all plants will survive and thrive in your fish tank, so you have to think twice before making this commitment. Nevertheless, natural aquarium plants come in a wide variety of shapes, sizes, and colors, and can create the perfect underwater decors. So, if you plan on housing them in your fish tank, here is everything you need to know about them. There are four vital elements that aquarium plants require to live – light, water, carbon dioxide, and nutrients. Each type of plant is different so don’t expect to accommodate all water plants in the same tank. All plants, whether we talk about regular ones or water ones, require water to live. Most aquatic plants are completely submerged into the water, but there are some that can grow above the water level, as long as they have their roots sunk. Light is the most important source of energy for plants and, in order to keep them alive inside the fishbowl, they will require full-spectrum lighting that replicates natural lighting to promote the process of photosynthesis. The amount of light needed for each plant varies, but most of them will thrive at 10-14 hours of light per day. Just like all other live organisms, plants also require a mix of nutrients or “food” to ensure proper development. Potassium, phosphorus, and nitrogen represent the three main elements that can nourish plants and help them grow strong. Plants usually obtain these macronutrients from fish waste as it decomposes in the water. The rest of the micronutrients can be absorbed from tap water, so make sure you change the water at least once a week to allow the micronutrients refresh. As biology would tell us, live plants transform regular CO2 or carbon dioxide into oxygen through the process of photosynthesis. Although your water tank already has a certain concentration of CO2, you can increase it by choosing a carbon oxide injector. 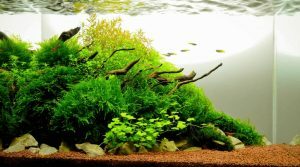 What are the easiest types of aquatic plants to look after? There are three main plant categories you can grow in your aquarium – foreground, midground, and background. Each of them requires different conditions of lighting, so you need to understand their necessities in order to help them grow strong and healthy. Foreground plants include Willow Moss, Water Wisteria, and Dwarf Baby Tears and tend to be spread horizontally on the floor of your water tank. They usually stay on the ground as they need something solid and won’t grow too much. 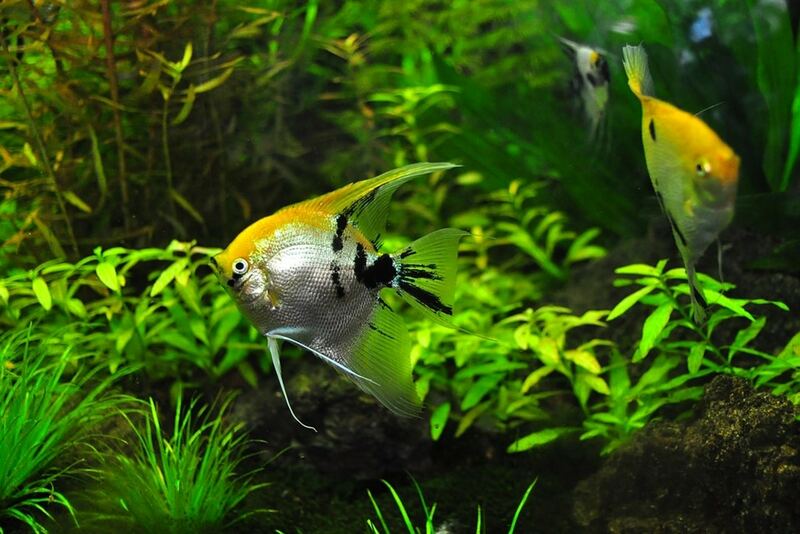 Since they multiply easily, foreground plants are excellent water filters, maintaining the water’s high quality, which makes it suitable for both plants and fish. Most of these plants have a decorative purpose too and don’t require special maintenance. They are hard to kill and prefer warm waters between 72 and 90 degrees Fahrenheit. Anubias Nana is a beautiful midground plant that can tolerate almost any type of environment or water quality, meaning it represents the perfect choice for your aquarium. It has semi-round leaves and is of medium height. It prefers medium lighting and waters up to 78 degrees Fahrenheit. It is primarily used for protection and decoration and goes perfectly with stone. Dwarf Sagittaria is another midground plant that is easy to look after. It reaches a total height of up to six inches and requires similar water and lighting conditions as its predecessor. It looks perfectly around stonework or driftwood as it can place its roots into them. Pogostemon Helferi is one of the most interesting foreground plants available nowadays. Its beauty lies in the zig-zag shape of the leaves and it has a “blooming” growth pattern. It thrives in medium lighting conditions and waters up to 78 degrees Fahrenheit. You could also opt for the Green Tiger Lotus. This wide-leaf variety is beautifully colored and requires little maintenance. It can become an excellent base for aquarium backgrounds and fish can hide in it. Moderate lighting and average water temperatures of 71-82 degrees Fahrenheit are the perfect conditions for it. When one of the four factors previously mentioned is lacking, your plants will suffer. Similarly, too much light, water or carbon dioxide can cause irreversible damage. One easy way to ensure your plants receive enough light is to use full-spectrum lighting that can provide up to 5 watts per gallon of water. Investing in a quality timer is a convenient way to provide over 12 hours of permanent light per day for your plants. You should also use high-quality substrates and fertilize your plants as often as necessary. This will help them receive the necessary amount of nutrients and keep them healthy and growing. Lastly, don’t forget to clean your aquarium regularly using the right products and substances. The walls need to be clean, so you can have a clear image of what’s going on inside the tank. This way you will not only supervise your fishes’ activity but can also take a look at your plants and see if they receive enough nutrients and lighting. However, although natural plants look amazing in your aquarium, they may not be the best solution for those with busy schedules. Plants, just like fish, need constant pampering and care to grow healthy and strong, and this cannot always be achieved. If your schedule doesn’t allow you to look after your plants and fish properly, we suggest choosing low-maintenance natural plants or replace them with artificial ones. A high-quality plant replica looks identical with the natural one and doesn’t come with instructions.